New York, NY – July 19, 2011 – Tor Books, an imprint of Tom Doherty Associates, LLC–the largest publisher of science fiction in the world–is excited to reveal the title, cover, and release date for the second novel in the Halo Forerunner Saga, HALO: PRIMORDIUM, written by legendary science fiction author Greg Bear. Book One of the Forerunner Saga, Halo: Cryptum, is currently available in hardcover, and will be released in a trade paperback this fall. Book Two, HALO: PRIMORDIUM, will be released January 3, 2012 simultaneously alongside its audio edition. The New York Times bestselling Halo series, based on the hugely successful Halo videogame franchise for the Xbox 360, has sold millions of copies, and is part of a global phenomenon that has dominated the science fiction landscape over the last decade. 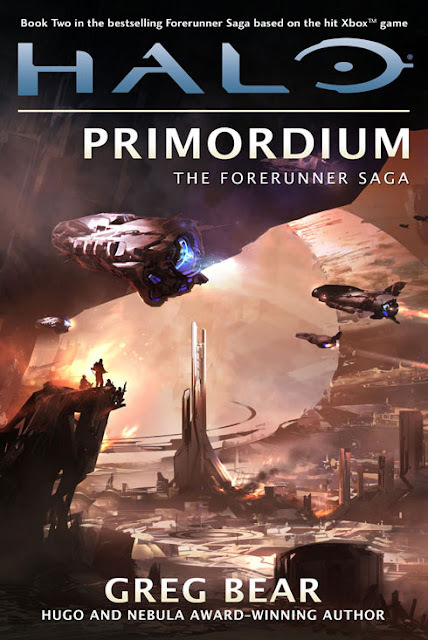 With Halo: Cryptum, Greg Bear began a three-novel saga set in the era of the Forerunners, the ancient and enigmatic builders of the mysterious Halos, and the story continues in HALO: PRIMORDIUM. In Halo: Cryptum, a young, rebellious Manipular embarks on a dangerous search for artifacts belonging to the Precursors—long-vanished super-beings of unknowable power and intent. This quest sets off a devastating chain of events that nearly ends the Forerunner empire. In HALO: PRIMORDIUM, two humans who were former companions of the Manipular find themselves captives pawns in a cosmic game whose madness knows no end—a game of ancient vengeance between the powers who seeded the galaxy with life, and the Forerunners who expect to take up their sacred Mantle of duty to protect all living things. Tor Books has proudly partnered with Microsoft and 343 Industries to publish every book set in this iconic universe. Along with the first two books of the Forerunner Saga, Tor has also announced another all-new Halo trilogy penned by Karen Traviss that will explore the Halo Universe in the wake of the final events of Halo 3. Traviss’s first Halo novel, Halo: Glasslands, will be on shelves October 25, 2011. The Halo franchise is an award-winning collection of properties that have grown into a global entertainment phenomenon. Beginning with the original Halo: Combat Evolved for Xbox in 2001, the rich fiction of the franchise has since inspired a series of blockbuster Xbox and Xbox 360 video games, New York Times best-selling novels, comic books, action figures, apparel and more. To date, sales in the Halo franchise have eclipsed $2.3 billion. Microsoft recently dropped a bombshell on Halo fans at E3 with two big announcements: on Nov. 15 2011, Microsoft will release Halo: Combat Evolved Anniversary, a spectacularly remastered version of the original Halo campaign bundled with some of the most beloved multiplayer maps in Halo history–all created in celebration of the 10th anniversary of one of the greatest franchises in gaming history. Also announced was Halo 4, the hugely-anticipated next blockbuster installment that will mark the beginning of a new Halo trilogy when it releases in-stores during the 2012 holiday season.